The EIPL range of Infra-Red heaters are available with either a Ceramic Heater Plate or the Quartz halogen lamps. Infra-Red heaters are unique. 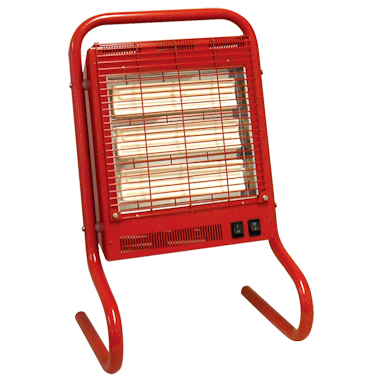 No other heater can compare for efficiency, economy, safety and environmental friendliness. If you need to heat a large building from floor to ceiling, then you need a conventional heater. However if you just need to heat a specific area, perhaps while people are working, or dry a freshly painted wall, an infra-red heater is the right tool. The EIPL range of Infrared heaters provide a quick and easy solution to spot heating. Heat is directed as a beam, exactly the same as a powerful torch. Approximately 90% of the energy using is converted to real usable warmth, directed at the very surfaces you need to heat and not wasted to the surrounding air, as with other conventional heaters. Heat from the QZ heaters is virtually instantaneous, making them ideal for builders, plasters and painters as they move from room to room. The QZ range of heats do not require oxygen, so ventilation is not required. No exhaust gases are produced, so there Is no build up of smells, fumes or water vapor as with paraffin or LPG Heaters. QZ Heaters do not contain a fan, making them draft free, they have no naked flame and are silent in operation. This means the QZ heaters are ideal choice for areas open to the public. QZ heaters are easy to use. There is no unexpected and inconvenient changing of gas bottles or messy topping up of fuel tanks. Infra-Red heating technology is very easy to live with. With no gas bottles to worry about, the EIPL QZ heaters can be moved quickly and easily around a building, even up and down stairs.